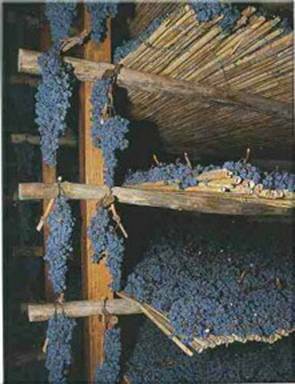 Original winemaking is so easy that it might simply have been established through accident: store a jar or bucket full of grapes, and in a few days the juice of the burst berries will have sharpened and become less sweet–and entirely more interesting–even if you do have to drink this primitive beverage through a strainer. But such wine has drawbacks: usually made from unpruned wild grapes, it would rarely have reached the brix (sugar levels) required for long ageing, and would have spoiled in only weeks or months. One of the first recorded clues we have about the steps that ancient peoples took to overcome this sugar deficit is in the Greek epic poem about Odysseus. Odysseus, you will recall, slipped a mickey to the Cyclops, Polyphemus, liquoring up the big squinty giant and poking him in the eye, thus making his escape. For those of us raised on cool old stop-motion animation films for our Mycenaean history, this is as far as we got. But if we read a translation of the text of the Odyssey, we learn that the wine he used was Maronean, a beverage ‘described as ‘red wine, honey sweet’ and so strong it was only ever drank diluted with water. For a poor Cyclops used to low-alcohol Sicilian plonk, Maronean wine served straight up must have been like a stun-gun to the cerebral cortex, dropping him like a load of mono-browed bricks. Interestingly, the story says he was so peevish upon waking up blind and hung-over that he threw a number of rocks at the retreating Odysseus, which now form an archipelago of tiny islands sticking out of the sea near Mt. Etna (see Carracci’s painting, above). Part of the strength of Maronean wine could be attributed to better cultivation methods–staking the vines instead of simply allowing them to grow up trees or over arbours, but the real secret behind wine so strong that it can’t be drank undiluted (at least not without consequences) is due to the incredible cleverness of these ancient winemakers–who actually invented the first recorded grape concentrate technology, now known as ‘appasimento’. By taking ripe grapes and drying them on straw mats they were able to increase the sugar content of the resulting musts until they exceeded 16% in potential alcohol–enough to drop an unsuspecting Cyclops in his tracks! Veneto legend has it that an incautious winemaker allowed his barrels to ferment completely dry, resulting in a 16-17% wine of incredible power and intensity. The very word ‘Amarone’ is derived from the Italian amaro, meaning ‘bitter’. Good Amarone has a tartness and astringency to it, with a luscious edge of raisiny-sweet black fruit, like a Christmas pudding poured into a glass.